Italy, second half of 11th century. Italian 16th-century blind-tooled brown morocco. William Bragge, Sheffield; his sale, London, Sotheby's, June 7, 1876, lot 121; Sir Thomas Brooke; Rev. W. Ingham Brooke; his sale, London, Sotheby's, Mar. 7, 1913, lot 10; C.W. Dyson Perrins; his sale, London, Sotheby's, Nov. 29, 1960, lot 98; purchased in Feb. 1961 from H.P. Kraus, New York for William S. Glazier (1907-1962), New York; deposited in the Pierpont Morgan Library by the Trustees of the William S. Glazier Collection in 1963. Ms. psalter; written and illuminated in southern Italy, second half of the 11th century. 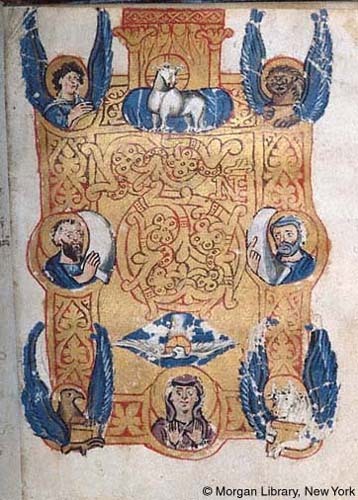 Decoration: 3 full-page incipit panels in gold and minium with figures, 10 full-page incipit panels in gold and minium, 5 half-page incipit panels in gold and minium, numerous small initials in gold and minium. Folios have been trimmed down from original size, affecting upper areas of two of three historiated initial pages.